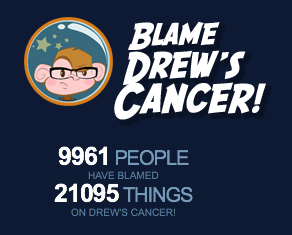 A couple months ago, we wrote about the site Blame Drew’s Cancer, which was hoping to utilize the Twitter phenomenon, and specifically the hashtagging of tweets, to raise both money and awareness for cancer. It has already garnered the support of Lance Armstrong’s LIVESTRONG foundation, and now it has a new big-time player aboard to sponsor some tweets: 23andMe. The genetic testing startup has agreed to donate $1 for each of the first 500 unique tweets that use the hastags #blamedrewscancer and #23andMe. These tweets will start counting after the site reaches its 10,000 person who has tweeted for the cause, which will be sometime tonight. The money will go towards the LIVESTRONG foundation for cancer research. 23andMe is also donating 5 of its new $99 research kits, to be raffled away to Blame Drew’s Cancer followers, also to benefit the LIVESTRONG foundation. Along with that, 23andMe is donating a kit to the namesake of Blame Drew’s Cancer, Drew Olanoff, to add his results to their Research Revolution project. And soon you’ll be able to buy the $99 kits through the Blame Drew’s Cancer site, with $5 of each sale going to LIVESTRONG, Olanoff tells us. In addition to all of that, 23andMe has agreed to be the main sponsor of Olanoff’s 24-hour Blame-a-thon happening on 9-9-09, and being streamed live to the web. This is another example of Twitter being used for charitable purposes. Last week, we wrote about TwitCause, a service that wants to spread the word about various good causes on Twitter — much like Causes does on Facebook and MySpace. BlameDrewsCancer is taking more of a grassroots approach, but it appears to be working. Watch Olanoff in the video below.